This is not just another compact scrubber. All of the SC351’s features come together to provide a first class scrubbing experience. It has a completely adjustable rotating deck, 14-inch disc, and it is battery powered; complete with an onboard charger. In addition to providing an outstanding scrubbing experience it’s also the quietest machine of its kind. The SC351 even makes daytime cleaning an option. There are no hard-to-reach areas with this scrubber. The SC351’s rotating deck allows the operator to clean around and under any obstructions in their path. This ingenious rotating deck even picks up water in reverse, allowing the operator to clean in all directions. Cleaning with cords becomes a thing of the past with the SC351. With an onboard battery charger that lasts up to 100 minutes per charge, productivity will be increased. The charger can be plugged into any electrical outlet, eliminating the chore of having to transfer the machine back and forth from the charging station. The SC351 is powered by an AGM maintenance-free battery that is easily accessible. The SC351 puts less strain on the operator because its brush-assisted operation does the work for them. Equipped with a brush motor, it maximizes cleaning power even on difficult surfaces. You can effortlessly adjust from high to low flow settings, customizing it to your needs. The SC351’s compact size and foldable handle, makes it easy to transport and store, even in the smallest of spaces. The SC351 is designed to clean in areas that other scrubbers cannot. 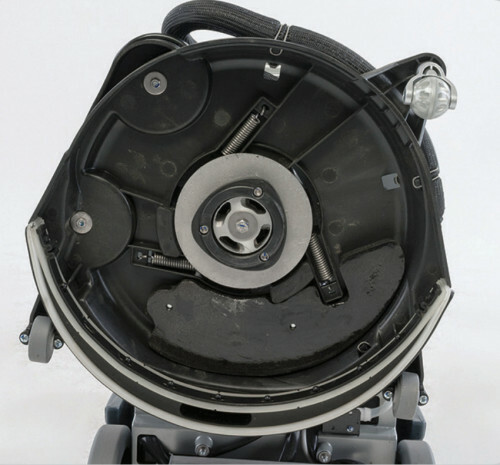 A typical floor scrubber must be able to travel through the area that it is cleaning since the squeegee is mounted at the rear of the machine. This makes it impossible to clean in some areas without leaving water behind. The SC351 solves this problem with a rotating scrub deck that allows you to clean into an area, rotate the squeegee the the front and pickup water in reverse. The SC351 has removable solution and recovery tanks that make it easy to refill the machine and dump the dirty recovered water. 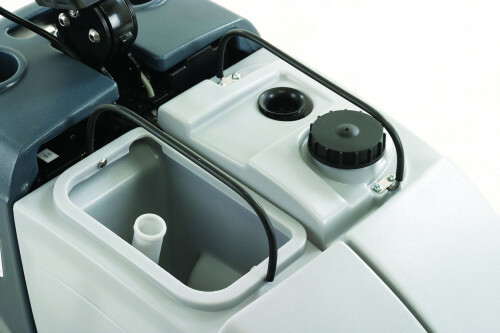 With a 2.5 gallon solution capacity and 3.0 gallon recovery capacity, the tanks are very easy to handle. 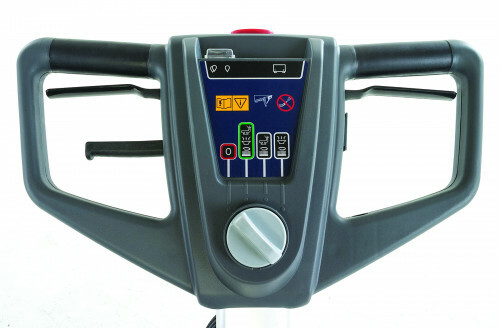 The SC351 is very easy to operate with simple, intuitive controls. The height of the controls can be adjusted to be comfortable for any operator and the brush assist drive makes it easy to maneuver. The daily maintenance on the SC351 can be completed without any tools. The battery is also maintenance free and comes with an automatic on-board battery charger.